David Hunter (1802-83), Maj. General, USA (Washington D.C.). 1st Bull Run (WIA), Department of MO. 1864 Shenandoah Valley campaign (burned VMI). Presiding officer, Lincoln assassination trial. 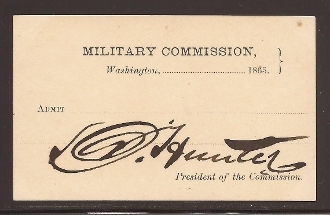 Rare pass signed by Hunter as President of the Commission entitled bearer to attend the trial of John Wilkes Booth's co-conspirators in President's Lincoln assassination. Unused. Highly desirable piece associated with one of America's early tragedies. Extremely Fine. Dark and bold signatures.